ISIS had been one of the region’s best-paying militias, with soldiers earning between $400 and $1,200 a month, plus a $50 “wife stipend” and $25 for each child in 2015, according to the Congressional Research Service. 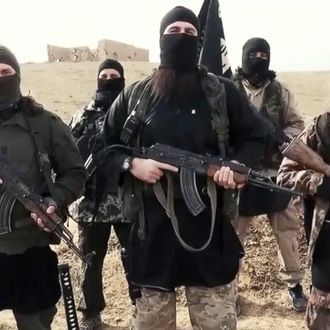 Syrian Observatory head Rami Abdel Rahman told AFP that the wage cuts will leave Syrian ISIS fighters with roughly $200 a month, whereas foreign fighters, who are generally paid double to reward their travels, will see their monthly income brought down to $400. Like any other state, ISIS faces a large challenge as it tries to maintain a functioning government on limited tax receipts. CNN Money notes that ISIS pays engineers and technicians upward of $1,500 a month to provide reliable electricity. The network calculates that in its most successful year ISIS pulled in roughly $2 billion in revenue — roughly the same amount that it cost previous governments to maintain the portion of Iraq that the jihadists now govern. For now, though, ISIS still has enough funds to support its branded-content division. The Mirror reports that the terror group has released a new video featuring clips from the Muammar Gaddafi–backed 1981 film The Lion of the Desert. The movie stars British actor Oliver Reed and depicts the victory of Libyan forces over Mussolini’s invading army. ISIS layers a threatening voice-over atop its mash-up of scenes, promising that its caliphate will expand until the black flag flutters over Rome. Or until their fighters find a better-paying doomsday cult. One or the other.